He was three-time Pro Bowler, but Tatum may be best known for his hit to Darryl Stingley that caused the Wide Receiver’s spine to sever between the 4th and 5th vertebrae. As hard as I could try, I couldn’t find a video of the play. I seem to recall it was a hard but not illegal hit. RIP Jack Tatum. 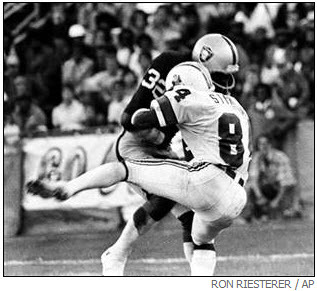 Former Oakland Raiders and Ohio State defensive back Jack Tatum Tatum died of a heart attack Tuesday in an Oakland hospital. Tatum, a three-time Pro Bowler, was 61. Known as “The Assassin” during his career, Tatum was renowned as one of the most feared hitters in the game. The footage of Tatum knocking the helmet off of Minnesota Vikings wide receiver Sammy White in Super Bowl XI is one of the marquee images in the history of the game. But Tatum’s most infamous hit came during a preseason game. In Oakland on Aug. 12, 1978, New England Patriots wide receiver Darryl Stingley ran head-on into Tatum on a crossing pattern. The blow severed Stingley’s fourth and fifth vertebrae and left the receiver paralyzed. Eventually, Stingley regained limited movement in his right arm and was able to operate his electric wheelchair on his own, but Stingley died from the after-effects of Tatum’s hit on April 26, 2007 at the age of 55. Chuck Fairbanks, the Patriots’ coach at the time of the collision, said he couldn’t find anything illegal or dirty about the hit. Tatum and Stingley never met after the hit. Despite Tatum’s failure to show remorse, former Ohio State teammate John Hicks said Tatum was haunted by the play. Tatum had said he tried to visit Stingley at an Oakland hospital shortly after the collision but was turned away by Stingley’s family members. Part of the alienation came after Tatum wrote the 1980 book, “They Call Me Assassin,” in which he was unapologetic for his headhunting ways. Tatum also wrote books titled “They Still Call Me Assassin: Here We Go Again” in 1989 and “Final Confessions of an NFL Assassin” in 1996. After starring for Ohio State under coach Woody Hayes, Tatum was drafted in the first round by Oakland in 1971. In nine seasons with the Raiders, Tatum started 106 of 120 games with 30 interceptions and helped Oakland win the 1976 Super Bowl. He played his final season with the Houston Oilers in 1980.